At twenty-eight (28) years of age, Purdy Scott enlisted with the 105th Overseas Battalion in Charlottetown. He volunteered on March 24, 1916. His service number was 712598. He was 5’ 9” tall with grey eyes and dark hair. Before enlisting, he worked on his parents’ farm in Cornwall. He was single. During the war, Private Scott served with the 8th Siege Battery. After Armistice, Purdy returned to Cornwall but did not stay. He travelled west and settled in Coos Bay, Oregon. He married Hattie Drake and they had one son, Gordon. Known as a poet whose words flowed without effort, Purdy Scott was a gentle man deeply affected by the war and the cruelty shown by man to his fellow man. Frank Stevenson worked as a carpenter while in western Canada and from there, volunteered with Canada’s Expeditionary Forces. He signed up on February 5, 1916 in Calgary, Alberta at the age of twenty-four (24). Frank volunteered with the 127th O. Battalion CEF. He was 5’ 8½” tall with hazel eyes and dark brown hair. Frank Stevenson was wounded while serving for Canada. Hugh Walker volunteered for the 105th Overseas Battalion. He was married to Elvira A. Murray and working as a farmer. He enlisted on January 12, 1916 at the age of twenty-six (26) in Charlottetown. His service number was 712484. Hugh had previous military experience. Corporal Walker served for five years with the P.E.I. Light Horse and the 82nd Regiment Militia. He was 6’ 2½” tall with grey eyes and dark hair. Corporal Walker was wounded while serving overseas. Hugh came from a large family. He had eight siblings: Neil, Daniel, Anna, Maud, Martha, Euphemia, Florence and Mary. Elvira and Hugh had six children of their own: Mary, Dorothy, Phyllis, Norma, Martha and John. Neil (Neillie), another son of John and Elizabeth Walker, enlisted early in the war. He volunteered September 24, 1914 in Valcartier, Quebec at the age of nineteen (19). His service number was 44049. Prior to enlisting, he served with the 36th Prince Edward Island Light Horse for two years. Gunner Walker was wounded overseas. Neil’s siblings were Hugh, Daniel, Anna, Maud, Martha, Euphemia, Florence and Mary. George Earl Warren worked as a carpenter when he decided to volunteer. He was one of three children. His brother and sister were John V. and Mildred. He signed up at the age of twenty (20) in Charlottetown. He enlisted with the 105th Overseas Battalion, service number 712803 on March 25, 1916. George Warren’s previous military experience included time with the Militia, the 82nd Regiment. He was 5’ 6” tall and grey eyed with black hair. George Warren was wounded while serving in the forces. Pte Horace Gardner. Born on January 25, 1897 in Birmingham, England, Horace Gardner was eighteen (18) years old when he enlisted with the 105th Battalion on November 11, 1915. Horace had been active in the 82nd Regiment when he enlisted. His attestation papers indicate that he stood 5 foot 5 1/4 inches tall and had red hair and blue eyes. Horace's Regimental number was 712090. Horace Gardner was killed in action on September 27, 1918 and is buried in France (information about his grave site can be found by clicking here). 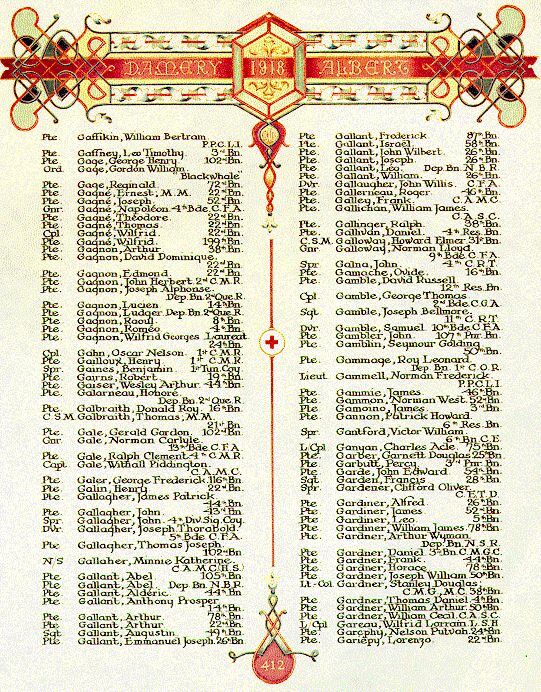 His name appears on page 412 of The First World War Book of Remembrance in the Peace Tower at Parliament Hill. (To view the page please click here). His name also appears on the cenotaph in Cornwall. His attestation papers can be viewed by clicking here.